Street rat! Scoundrel! Prince! If these names appeal to you, your acting wish may very well soon be granted. 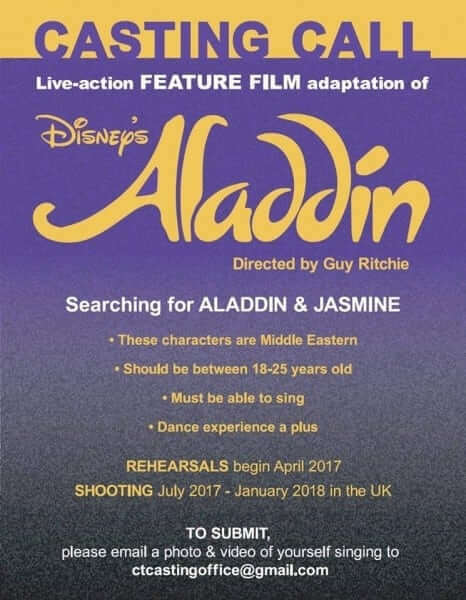 Guy Ritchie, director for the live-action adaptation of Disney’s classic “Aladdin,” has put out a casting call for actors of Middle Eastern descent between the ages of 18 and 25. He is on the hunt for his Aladdin and Jasmine, and apparently hoping to find them outside of Hollywood’s A-list. UPDATE 6/5/2017: CASTING IS NOW OPEN. To submit, email a photo and video of yourself singing to ctcastingoffice@gmail.com. The film will be a musical, like its predecessor “Beauty and the Beast,” that will hit theaters next week. This means whoever is selected has to have singing talent and dancing abilities earn brownie points here. The selection process won’t be drawn out either because shooting begins this summer in July with rehearsals beginning in April. This is not the first we’ve heard of Disney recruiting “outside of the box.” A similar casting call was recently put out for the remaking of “Mulan,” where notice was put out for actors speaking both English and Mandarin Chinese. Does anybody knows when is the last date to apply? I swear to freaking god if Disney chooses Daniel Radcliffe next for Aladdin, I will be beyond miserable. I’M DEAD SERIOUS !!! They aren’t going to, Jade. Did you even READ the article? They’re looking for someone who is Middle-Eastern. Happy now? We all need to see Adam Amani be the “Aladdin” ?? ?